Elimination Chamber! Fastlane! The last two split-roster PPVs (at least for a while)! Also, Kimbler Lee! Ultimate Deletion! Mixed Match Challenge! Elle's birthday! We have plenty to say about Takeover Philly and the Royal Rumble. Promising up-and-comers, returning legends, and invading MMA fighters. Check out Elle's wrestling coverage on With Spandex. We've returned for 2018! WarGames, Survivor Series, Clash of Champions, Wrestle Kingdom, and Total Divas! Promises we'll hopefully keep! Paige and Absolution and Riott Squad and more! We're back! We talk about TLC at length, plus stuff we missed during our hiatus: Hell in a Cell, Sami's heel turn, the return of the Shield, why Elle stopped watching Total Bellas, and more! The Mae Young Classic has come and gone, and you know we're never going to run out of things to say about women's wrestling! All our favorite matches, the wrestlers who won us over (plus the ones we already loved), a complete discussion of the last three rounds, plus the usual "but is WWE bad actually?" segment. And then Total Bellas! 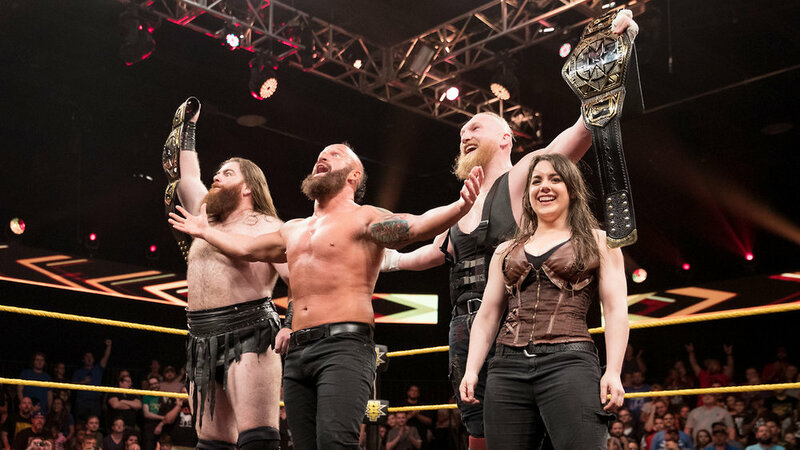 We finally found the time to talk about Summerslam and the show that always surpasses it, NXT Brooklyn! Great tag team matches! Excellent women's matches with questionable booking! Men's title matches of varying quality! Lots of great big dudes with beards! Rather than talk about Battleground, we decided to put together a list of wrestling and wrestling-related videos that make us happy when we're feeling blue, and share that happiness with you the listeners. It's time to talk about the PPV with the most ridiculous name, in which Dean Ambrose fights the Miz for the 400th time, Roman does his best to murder Braun, and Brock falls in love with Samoa Joe. We also talk about the Mae Young Classic, but this was recorded last week so we didn't know anything yet, including how to pronounce Princesa Sugehit. Elle and Megan talk about Money in the Bank, the whole big mess that grew out of Money in the Bank, and why it's time for Ellsworth to leave. After that, we talk about GLOW on Netflix and how much we love it and everyone involved with it.